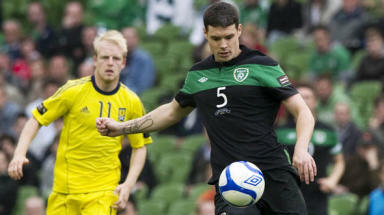 The Republic of Ireland defender wants to be a part of Giovanni Trapattoni's Euro 2012 plans. The defender was part of the Republic of Ireland side who defeated Scotland 1-0 in Dublin to help win them the Carling Nations Cup. Giovanni Trapattoni's men now turn their focus to a crucial Euro 2012 qualifier in Macedonia and O'Dea is keen to cement his place in the manager's plans. But he knows further caps will depend on how much game-time he is given at club level and the 24-year-old confesses he has no idea what the future holds right now. He has made no secret of his desire to remain at Celtic and hold down a first-team place under Neil Lennon next season. But, following a loan spell at Ipswich which was extended until the end of the season, O'Dea has yet to discover whether he still has a part to play at Parkhead next term. He said: "I will go back to Celtic but whether I'm there at the start of the season, I don't know. "It's a fantastic club and one that anyone would be privileged to play for. At the end of the day, with internationals like this, I need to be playing club football every week. "I will assess that when I go back for pre-season. If I play at Celtic, there is no other place I would want to be. But if I'm not going to play, we need to look elsewhere. "I'm going to have to move if I don't play. I'm a fan of Celtic and I've been there for several years now and there is no other place I would rather play. "But it is about playing, it's not about sitting on a bench and not being part of things anymore." O'Dea has yet to hold talks with Lennon over his future, with the Hoops boss likely to sign a new contract in the coming weeks to secure his own position at Celtic. The centre-half said: "When I went back, he had a league and a cup to think about so it wasn't the time or the place to speak to him then. "But there is plenty of time over the summer and I will be back in pre-season so I will see what happens. I don't know where I will be at the start of the season." Robbie Keane grabbed the only goal of the game against the Scots to bring his tally to 49 international goals, as the Republic claimed the silverware from a tournament which also saw them romp to a 5-0 win over Northern Ireland, as well as a 3-0 victory over Wales in their opener in February. The meeting with Craig Levein's men provided the toughest test of the three games and, according to O'Dea, sets the Irish up nicely for this weekend's clash against Macedonia. He said: "It wasn't the prettiest game but we won and we kept a clean-sheet so we are all delighted about that. "It was very good preparation because the big one is on Saturday and it's nice to leave on a winning note. Hopefully we can carry it on into Saturday's game."